Many people find the book of Revelation hard to understand. This is true because the Apostle John used “Apocalyptic Writing” (which uses a lot of symbolism) when he penned the book of Revelation. 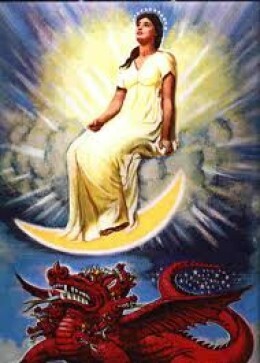 In this study I am going to discuss chapter 12 (The Woman and The Dragon) of the book of Revelation. Hopefully I can provide some understanding to this piece of scripture. At the time John wrote the book of Revelation all of the disciples had been martyred and the Roman Emperor Domitian had ordered that John be executed by throwing him into a cauldron of boiling oil, but God intervened. God protected him, and kept him alive. Since he couldn’t kill him, Domitian had John exiled to the island of Patmos. The church was under heavy persecution, so many theologians believe John wrote the book of Revelation in Apocalyptic writing in order to get his message past the Romans and to the seven churches.